We've all been there before. You're overcome with this incredible urge to create your next culinary masterpiece only to discover that your refrigerator is mostly empty and your cupboards are mostly bare. The frigid temperatures outside your nice, warm home are preventing you from running out to pick up some items at the grocery store, so you're left asking yourself, "Now what?" I found myself in this particular predicament last week. I wanted something sweet but didn't have the proper ingredients for a batch of cookies or brownies. (I also didn't have the motivation to spend the entire afternoon baking.) I remembered I had a sheet of frozen puff pastry leftover after making my Forelle Pear Tart, so that was a start. Then I remembered I had a pink grapefruit in the refrigerator that was begging to be eaten. The wheels in my brain started turning... Could I really create a tart with grapefruit? Turns out, the answer is yes! The tart turned out deliciously and pairs perfectly with a hot cup of coffee. I was worried about making the tart too sweet and masking the flavor of the grapefruit, but the grapefruit was unmistakably still there. This recipe is a great example of tasting as you go. Grapefruits will differ in flavor, so it's important to taste a bit of the grapefruit you use before proceeding with the addition of the sweeteners. You may need more or less than the amounts I've suggested below. If you trust your taste buds, I guarantee, this recipe will deliver! Place puff pastry on lined baking sheet. To prevent too much "puff," prick the pastry a few times with a fork. In a bowl, gently toss the grapefruit segments with the honey and 1 tablespoon of sugar. Taste and then add more honey or sugar if necessary. Crimp the edges of the pastry, then arrange the grapefruit segments on the puff pastry, making sure not to add too much extra juice. The extra juice will make the pastry soggy and the grapefruit will burn before the pastry has sufficiently baked. Bake for 30 minutes. Remove from the oven, sprinkle with the remaining sugar, and bake for an additional 10-15 minutes. Remove from the oven and allow to cool for at least 5 minutes before cutting and serving. I'm not a big grapefruit fan, but this looks amazing. if you can wait 5 minutes - this looks very tasty! Your creation intrigues me...not too gooey sweet, I imagine. I actually have a delicious pumelo (half grapefruit-half orange) and some frozen puff pastry in the freezer. mmmm, maybe. FOODalogue - Definitely not gooey sweet. 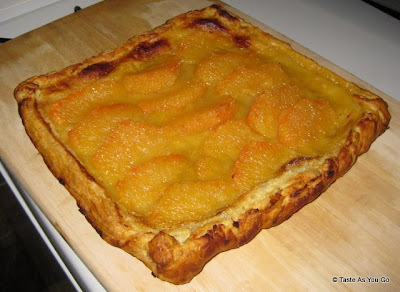 The Forelle Pear Tart I made was much sweeter because I used quite a bit of brown sugar. This tart had the perfect balance of tart from the grapefruit and sweet from the honey and sugar. Another thing I was considering doing with the tart was drizzling just a bit of chocolate on the top to add a bit more sweetness after it came out of the oven. But I held back. The chocolate might work well with the pumelo tart... If you decide to try making it! Oh wow! What a cool idea. Never would have thought to use grapefruit like this. Thanks a bunch. Cooking is like that.. experiment with the ingredients you've at the moment and better if turns out delicious!! Gera - I'm very relieved it turned out delicious! Sometimes you think you're going to have a winner when all is said and done and you wind up having something the complete opposite! Next time I make this, I'll probably try to jazz it up with some spices and/or chocolate drizzled on the top. Why stop experimenting, right? Lovely easy recipe. Thanks for sharing..
Soma - Thanks for stopping by!